We didn't pay 5 star prices so we got what we paid for. Apartment was clean and newly painted, bedding and towels were clean but not changed all week. No kettle or crockery of cutlery or glasses in apartment. The food was ok for the price we paid, plenty of fresh fruit and salad, cheaper cuts of meats, pasta and potatoes, bread, hot vegetable dishes and very nice dessert, drinks were very basic. The waiter staff at the All-inclusive restaurant are fantastic!! The locals are great people and the location is amazing. Overall we had a great time and would go again!!! The rooms were not very well cleaned and we were informed we could only have clean towels every four days so the towels were always filthy after a couple of days and we then had to wait another couple of days for fresh ones! Apart from that the rooms were large and comfortable with plenty of storage space and a nice bath/shower. However, the all inclusive was basically a real con, you could only get free drinks from 11am to 11pm in the all inclusive restaurant, and were not allowed to take drinks out of the restaurant. The restaurant is nowhere near the pools or beach so if you are in either of those locations you had to buy drinks! Also, the only drinks included in the all inclusive were wine, beer and soft drinks - no spirits! The portions were poxy and they operated a very strict 2 drinks per person rule! As I was there with a large group it was a real nuisance that we all had to keep going up separately for our drinks! There was never enough bar staff at the all inclusive so it was a bun fight to get drinks, and they randomly only serve all inclusive drinks until 9.30pm on a Tuesday and Sunday because they have entertainment on those nights! The entertainment was rubbish and we would have much preferred the free drinks! There was also a 2,50 euro charge per day for a sun bed on the beach, although this did include a free drink. My advice to anyone would be not to bother with all inclusive as there are loads of bars and tavernas around serving very good food and drinks and the location is beautiful! The Paradise Beach Hotel, formally the Golden Bay Hotel was dirty and smelly. Unfortunately we were there when Kosmar went bust on Friday 12th Sept. 2008. The very next day the owner demanded of approx 15 couples that we all pay 120 Euros from the Friday 'til Monday in cash.And then 30 euros a day from Tuesday to the following Tuesday of departure. The owner would not accept credit cards, and threatened all with eviction with police assistance, if we did not pay. So we paid twice for a room that was truely awful. There is very little in the way of crockery and only one spoon, knife, fork etc. A request for more fell on deaf ears. So we bought our own, and no kettle either. Draw your own conclusions, but having also talked to others staying in other accomodation flying the Fereniki flag, this is standard treatment. After reading previous reports on this accommodation we had been worried but it turned out to be lovely. We stayed in an apartment at the Foundoulis part of the complex and they were very spacious and clean. The staff were helpful providing extra pillows when needed. The pool was lovely and it was cleaned twice during our weeks stay. I would definitely use this accommodation again. We booked the Metropol Hotel through Manos. 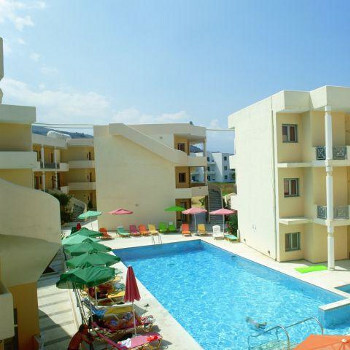 Unfortunately we did not realise until after we made the booking that this property is linked to the Fereniki complex. The room itself was ok but we had a real problem with sewage smells coming up through the drains which became so bad we had to abandon using one bathroom and sealing the door with towels to stop the smell entering the bedroom. I would not recommend anybody stayed at this property, the Fereniki or the other Manos property which is also owned by the Fereniki called the Foundoulis apartments. The staff are very unhelpful and infact spend most of their time ignoring you. The reception staff were the best at this. The cleaner we had was a lovely woman but with the amount of rooms she had to clean could only manage a light clean. Sheets are only changed once a week. We made friends with our cleaner and managed to get sheets more frequently. Clean towels were very hit and miss and in fact we, along with other guests, resorted to 'stealing' fresh towels from the linen room when it wasn't locked. The pool at the Metropol is very small no bigger than a garden pond and there is no sun lounge area at all around it. Of the few people I saw use it one was a local builder fully clothed, washing his arms and legs after a mornings work. The pools at the Fereniki and the Foundoulis were not much better. For the whole two weeks I did not see any of the pools being cleaned. The Fereniki has a really bad reputation, even locally, and even our Manos rep admitted that the rooms at the Fereniki were awful. The Manos rep told us that he found the staff so unhelpful and had got into so many arguments with them that could no longer deal with the staff at the Fereniki, which is not much use if you have a problem. Although we had a great holiday this was down to the resort which I would really recommend but definitely don't go with Manos, try Kosmar they seemed to have some great properties. An absolute shambles, we were put in a room over night,as our apartment was over booked it was like a cell and only had two beds not three. One of the staff was supposed to come back with another bed but never came. The next day after a lot of hassle we were taken to a studio which we refused as we had booked a one bedroom apartment, we eventually got what we had booked and were very pleased with the apartment. Also, when I went to collect my passport the staff completely ignored me then when I asked where is my passport they could not find it as they has over booked so many people they didnt know what rooms or even hotels people were in. Fortunately I did get my passport back after waiting half an hour for them to check every passport they had. Even though the apartment was really nice I wouldn't return because of the trouble of over booking (there was a constant stream of people with the same problem at reception) and the unhelpful staff.